As Jesus wends his way to the cross I think it is important to remember his teachings about the life we must lead to inherit the kingdom. We may be counting on his crucifixion and resurrection to be the sole road to salvation, but in Mathew 25 Jesus talks about ways we can be saved or be lost. This parable makes it plain about the life the Lord expects us to lead if we follow him and seek eternal life. 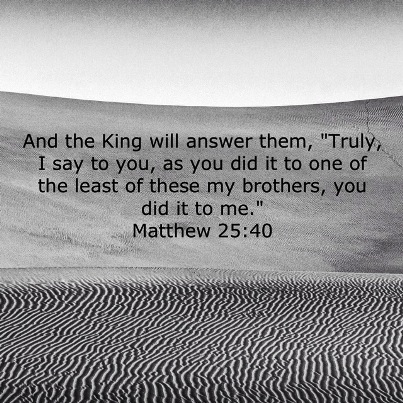 In His Kingdom we help those in need, even though they are the least of us, the poorest of us, the most down trodden of us, because as we do so we are helping Jesus himself. That is his charge to us to be a Beloved society, that cares about our neighbors and all of God’s children. So when you think that just believing in Jesus as the Son of God who rose from the dead is your ticket to Heaven, I suggest that you look at the way you treat your fellow man and woman as equally important in your life and in your journey to the afterlife. This is the caring world that our Savior is asking us to create as part of our life as a follower of Him.